I've never gone this long without posting a new blog. Even when I was in the hospital in 2010, I still managed to post something! I was planning to post several new blogs this summer, but that didn't happen. We were on the road all but three weeks of our son's summer vacation. One trip was personal; the rest were business. We ended up driving over 5,000 miles through nine states in the Midwest, Northeast and South before we were done. Fortunately, we were able to come home a few days between trips. This gave me just enough time to get the laundry and mail caught up before heading out again. Although I had every intention of writing while on the road -- I took my notes and a USB full of food pictures -- at the end of a long day, I was just too tired to write. No sooner had we gotten home than it was time to get back into the routine of work, carpools and chauffeuring my son to and from sports practice several times a week. Things are finally back to normal and I'm putting the finishing touches on a new blog. In the meantime, I want to answer the questions readers emailed me over the summer. Strawberry glaze is sold in the produce department in either a pouch like the one pictured above or a plastic bowl. It's available in regular and sugar-free versions. Japanese bread crumbs -- also called panko -- are often used to coat foods that are fried. These bread crumbs don't absorb as much oil when fried so the food has a crispier crust. I think pecans taste better when you chop them as you need them. Around the holidays, many organizations sell one pound bags of pecan halves -- like the one pictured above -- as a fundraiser. I buy several bags, store them in the refrigerator so they'll stay fresh and use them whenever a recipe calls for pecans. Nothing dries greens faster or better than a salad spinner. I always thought this was a useless kitchen gadget until I actually used one. My salad spinner is over 20 years old. It has a crank on top you turn which spins the inner basket. Some newer models have a cord you pull to make the basket spin. If a recipe calls for 2 cups sifted flour, you sift the flour before it's measured. If a recipe calls for 2 cups flour, sifted, you measure the flour before it's sifted. My mom had a flour sifter with a crank. I never liked it so I bought one that had a spring action handle. Unfortunately, the handle always got stuck so it was too much trouble to use. Anymore, I use a mesh strainer to sift dry ingredients. I put the ingredients in the strainer and use my hand to tap the side of the strainer so the ingredients fall through the mesh into a bowl. I have three strainers -- small, medium and large -- so I can use the one that's the right size for the job. When you want to freeze food like hot dogs, hamburger patties, cookies or rolls, put the food on a baking sheet in a single layer, making sure the items aren't touching. If you're freezing something sticky, line the baking sheet with parchment paper first. Put the baking sheet in the freezer until the food is frozen. Transfer the food to a plastic freezer bag or storage container. It won't stick together when stored because each piece was individually frozen beforehand. You can substitute fresh herbs for dried and vice versa, but use a 3:1 ratio and not equal amounts. Dried herbs have a stronger flavor than fresh herbs so you'd need less dried herbs than fresh. For example, if a recipe calls for three tablespoons fresh herbs, you'd substitute one teaspoon dried herbs. When cooking with dried herbs, add them at the beginning of the recipe so they have time to release their flavors. If you're using fresh herbs, add them toward the end of cooking so they won't lose their flavor. I absolutely love the pineapple slicer I bought a couple of years ago!!!! After eating fresh pineapple, it's hard to eat the stuff in the can. If this slicer ever broke, I'd definitely buy a new one ASAP! Click here if you want to see how this device works. I don't like off brand gelatin or canned soup. I also don't like off brand refrigerated baked goods, such as crescent rolls, biscuits, pie crusts or off brand frozen biscuits and garlic bread. However, I do like and use off brand frozen deep-dish pie crusts and pancakes. Pure vanilla extract is made with vanilla beans and a solution of alcohol and water. Imitation vanilla is made from artificial flavorings and leaves a bitter aftertaste. Pure vanilla extract is more expensive, but I think it's worth every penny! My mom taught me to spoon ingredients into a measuring cup and level them off with the back of a table knife. By spooning ingredients into the cup, you don't run the risk of packing them down which could cause an inaccurate measurement. The most accurate way to measure ingredients, though, is the way we did it when I worked in a bakery. We'd measure the ingredients on a kitchen scale, adding or subtracting ingredients until we had the right amount. Not only was it accurate, it was much quicker than measuring cup after cup of flour or sugar. The marinating dos and don'ts were from a blog I posted in 2010 with the recipe for Marinated Pork Tenderloin pictured above. The tips can be viewed here. You can, but I don't advise it. Cooking wine tends to be saltier than regular wine. The caterer I worked for in the early 1990's used to say, "If the wine's not good enough to drink, don't use it for cooking either!" I'm glad you liked it! It's actually a lazy Susan and not a cake plate! I ordered it from Amazon.com. Here's what it looks like without anything on top. Gravy flour, also known as Wondra, is a finely ground all-purpose flour that dissolves instantly and is unlikely to form lumps. It's sold in the baking aisle with all-purpose, self-rising and bread machine flour. Yes, I do have a lot of recipes. Sometimes I think I have too many recipes! I'm old fashioned and write my recipes on recipe cards and insert them into clear plastic recipe sleeves to keep them clean. When I first started cooking, I could store all my recipes -- even the ones I hadn't tried yet -- in the strawberry recipe box pictured above. As my recipe collection grew, I kept my tried and true recipes in one box and moved all the untried recipes to another recipe box. Nowadays, I keep all my untried recipes in the four boxes pictured below and my tried and true recipes in the picture albums shown above. 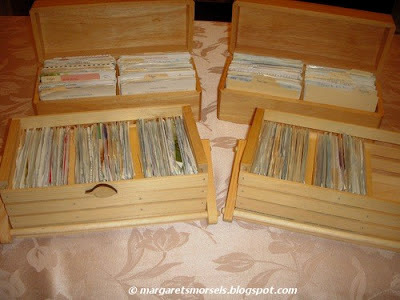 The picture albums take up less space than recipe boxes! Thanks for emailing all the great questions! If you've got a question and didn't see it here, email it to me at margaretsmorsels@yahoo.com and I'll do my best to answer it in the next Q & A installment. Check back soon for the recipe for one of my favorite Italian dishes!